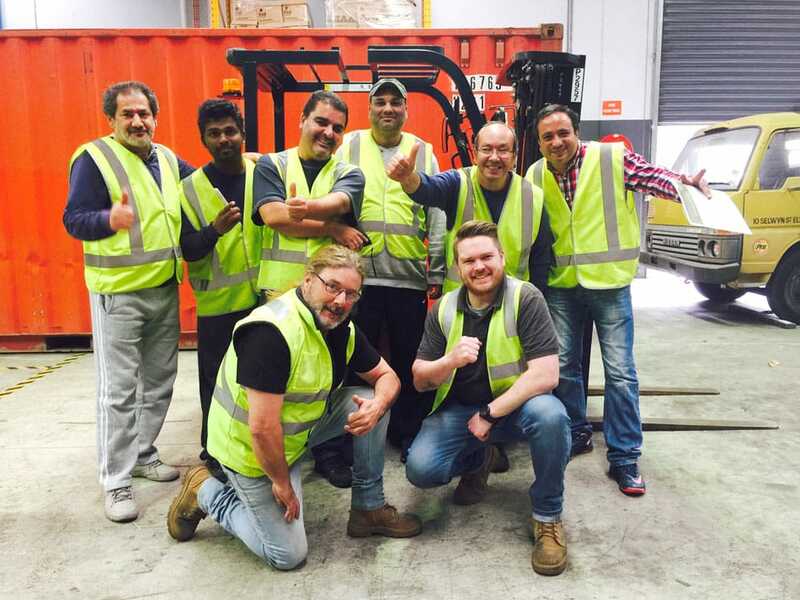 into Melbourne’s most popular forklift licence course! Trainix is a professional forklift licence training company offering a range of forklift courses for individuals and businesses throughout the Western Suburbs of Melbourne and all over Victoria. We are 100% committed to providing you with the highest quality, current forklift licence courses available in the industry. There has never been a better time to get a forklift licence. There has been a massive increase in demands for licensed forklift drivers in the workplace. Now is your chance to gain the skills for your next job opportunity! Our forklift training centre is located in Hoppers Crossing, just outside of the Melbourne CBD and near suburbs Werribee, Point Cook, Tarneit and Altona. We also offer premium services such as onsite forklift licence training and forklift refresher training courses for businesses who want to upskill or refresh their forklift driver’s knowledge and practical skills at their workplace. Unlike some of our competitors, we don’t just train you to pass your forklift test; we make sure you have the skills and knowledge to work safely and competently in the workplace. However, that’s not all, when you enrol in one of our forklift licence courses you will also get the best customer support and service around! We train you to become job ready! At Trainix we have a range course options to suit the needs of our students. From single courses to combined course packages where you can save money, we will be able to help you take the next step in your up-skilling goals. If you are not sure what course options would be best for you, please get in touch with one of our friendly team members. Please note: For all Forklift and Order Picker courses, the will be a $65 WorkSafe licence processing fee that is payable to Australia Post upon successful completion of your course. Trainix have no control over this fee, and is subject to change without notice. • Appropriate clothing – No open-toed footwear etc. • Must have completed study material. This material must be submitted on the first day of your course. Our 2-Day Forklift Training Course (LF Licence) is designed for students who are complete beginners to students with years of experience operating a Forklift. If you are looking at finding work in the warehousing and logistics industry, then an LF Licence is a great way to get your foot in the door. The staff at Trainix are here to help! We encourage anyone thinking of enrolling in our Forklift Licence Course to get in touch with us to find out more information and to see if this LF licence course is right for you. Upon successful completion your forklift licence course, you will receive a ‘Statement of Attainment’ (within 30 days) and a temporary Worksafe ‘High Risk Work’ LF Licence (Notice of Assessment). When you submit your paperwork at Australia Post, you will need to provide passport-sized photos for your forklift licence. Depending on where you choose to have your passport photos taken, the prices vary from about $16-$24. when you submit your paperwork. This fee is for WorkSafe to issue you an official national ‘High Risk Work’ forklift licence. You are required to provide 100 points of I.D when submitting your paperwork at Australia post. We require a minimum 50% deposit at the time of enrolment. If you happen to be unsuccessful in any section of your assessments, we offer one free retest. This must be completed with 60 days of your original course date. If you are unsuccessful after the free retest a $250 fee will be required for each retest thereafter. Weekend forklift courses available – no extra charge. If you’re working full time, we understand that it’s difficult to get the time off to be able to complete a training course and that’s why we offer weekend courses regularly. Unlike some of our competitors, we do not charge any extra to attend a weekend course. Since we’ve opened, we have had a constant stream of positive feedback from our students and clients. We promise to work hard and to make sure that our students are getting the best training experience possible when they attend our training courses. If you need extra help with anything, either practical or theory based, we’ll be ready to make sure you get the attention you need. Everyone gets treated with the utmost respect, and we make sure the learning space is a comfortable and relaxed environment. This makes it so much easier to learn! Our trainers have lots of patience and are willing to spend time with you if you’re having trouble with anything during the course. We’re always up-to-date with any changes in regard to training methods, safety, compliance and other regulations. You can guarantee that we’re always changing the way we do things to make sure we’re on top of the current procedures. Our training centre is modern, clean and fresh with a chilled-out atmosphere. Our trainers are personable, patient and friendly. The equipment we use is relevant to the industry standard and always in good condition. To be able to gain a forklift licence, you’ll need to pass 3 assessments successfully: Knowledge, Calculations & Practical assessments. With the way we train you while doing the course, we’re confident that you should gain a good understanding of everything that’s required to pass your assessments, but sometimes it can be a bit too difficult, and we understand, that. Unlike other companies, we offer the guarantee of a free re-test on any part of the assessment you didn’t pass. This can put your mind at ease and gives you the chance to come back, at no extra charge to have another go at the assessments. Convenient forklift training courses in Hoppers Crossing, close to Melbourne. The western suburbs are thriving with new housing and industrial estates. We’re located smack bang in the middle of it all! Easy to find, just off the Princes Freeway. Public transport is no issue either with Williams Landing and Hoppers Crossing train stations close-by. Buses from either train station can drop you off right at the end of our street at Graham Court. Shops and cafés are not far away either with plenty of options ranging from Indian cuisine to burgers and kebabs! Our trainers and staff have worked in the warehousing industry as forklift operators, safety representatives, and storemen before they were trainers. This means they understand what actually happens in the workplace and what is expected of you when you’re working as a forklift operator. We believe this is what sets us apart from competitors who have trainers that have not worked in the industry before. It’s important to be trained correctly and to the standard, but it’s, more important to have training that reflects what is happening in the industry today. To back this up is our positive feedback from students that mention the knowledge and guidance from our trainers are of a very high standard. Having a forklift licence is all good, but it’s only the beginning. To put it into practice in the workplace and to operate safely and competently after you’ve gained a forklift licence is another thing altogether. With the years of experience that our trainers have had actually worked in the industry as forklift operators, they know what you’ll be heading into when you get out there in the workplace. We don’t just train you to get your licence; we’ll get you ready for a job as a forklift operator as well. Our trainers will be able to answer your questions about forklift operating in the workplace and help you to understand the challenges you may face when working. Trainix is a vibrant place, where it’s not uncommon to have multiple courses running at the same time in 1 of our 3 classrooms. We provide coffee, tea, biscuits, filtered water, fridge, and microwaves on-site so you can bring a lunch with you. From the moment you first step into the reception area, decorated with handmade up-cycled furniture built from old pallets to the large warehouse space where the forklifts, order pickers, boom and scissor lifts all operate, we have made a huge effort for the whole place to be a positive, professional, clean, modern and friendly environment. It’s important to us that our students are comfortable when learning because we believe that’s the right way to get the best results. No one wants to be part of a course where they are made to feel stressed. We feel that this part of why so many of our students keep coming back for different training courses! Whether you have never seen a forklift before or you have spent years in warehousing and just never got a forklift licence, we have the training to suit any level of experience. With the right training, we can then help you find work in the industry. Getting a job isn’t always easy, so we do our best to help get you a foot in the door with one of many recruitment agencies that we have dealt with in the past. There are certainly no guarantees, but we will make sure to offer help getting a start. If you’re already working and are getting licensed to upgrade your current position at work, we will work with you to make the training as relatable to the tasks that you’ll be performing at your workplace. If you spend more time loading trucks, we can focus on that. If you constantly have to travel in reverse because of the loads you carry, we’ll work with you to do that as safely as possible. Whatever it is you need to learn for work, we’ll do what we can to as realistic as possible. ARE YOU READY TO DISCOVER A NEW ERA IN FORKLIFT TRAINING? ASQA Registered | Trainix RTO ID 45470. All of our HRW Assessors are authorised by WorkSafe Victoria. © Copyright 2019 Trainix Pty Ltd. All Rights Reserved.